Quarterback Drew Brees made only one mistake during Thursday Night Football game at Mercedes-Benz Stadium, but it was a costly one that allowed the Atlanta Falcons (8-4) to hold on to a 20-17 victory against the division-leading New Orleans Saints (9-3). Brees, who had two touchdowns on the night, had the Saints in the red zone once again and was trying to lead them to another comeback win. The Saints were on the Falcons’ 11-yard-line with 1:25 remaining in the game when Brees tried to find Josh Hill in the end zone, but linebacker Deion Jones intercepted the pass to secure the win and hand the Saints their second loss in the last three weeks. Brees completed 26 of 35 as he passed for 271 yards, most of which he directed towards Michael Thomas. The wide receiver, who found the end zone for the second week in a row, finished with 10 catches, 117 yards, and one touchdown. Falcons quarterback Matt Ryan had three picks, but still managed to lead the Falcons to their fourth win in the last five games. 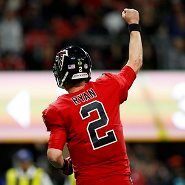 Ryan completed 15 of 27 pass attempts and passed for 221 and a score, but the Falcons defense kept them in the game by keeping the Saints running game in check as the two-headed monster of running backs Alvin Kamara and Mark Ingram was limited to a combined 51 rushing yards and no touchdowns in 13 carries. The Falcons trailed 17-10 in the third quarter, but they scored 10 unanswered points to take the lead. First, Ryan found Mohamed Sanu in the end zone with an eight-yard touchdown pass with 9:55 left in the game. Then, about six minutes later, Matt Bryant kicked a 52-yard field goal to give the Falcons the three-point lead. Both teams will meet again on December 24, this time in New Orleans, in a matchup that could very well determine who will win the NFC South. The Carolina Panthers (8-4) will also play a role in the battle for the division crown as they have yet to visit the Falcons on December 31.